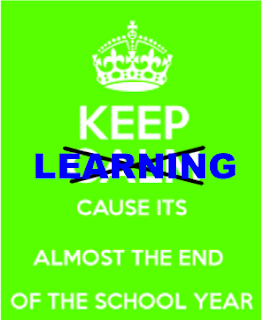 Learner and Leader of 21st Century Education: Don't countdown, but make the learning count! Don't countdown, but make the learning count! The days leading up to summer vacation can be some of the most challenging in classrooms. It is critical that teachers have a survival plan in place. Oh and there is not any place in that survival plan to share a countdown with students. Well maybe in the last 5 days, but not before then. Instead of focusing on the countdown, focus on making the learning count! One thing I do to end the year with a bang is to use one of my favorite books for reading. We do a unit on Charlie and the Chocolate Factory that includes painting with chocolate pudding, creating character puppets, using recycled materials to create a new candy making invention, taking a virtual field trip to Hershey's chocolate factory and so much more. We end the unit by inviting parents to the classroom to see Mrs. Tuttle's Chocolate Factory where kids show their parents all the activities they have completed over the past two weeks. When I see my previous students, this the first thing they will talk about, our Chocolate Factory Unit, and when my students come in for meet the teacher, inevitably one, two, or a few will mention how they can't wait to do it at the end of the year. So pick a book that you enjoy and want to share with the students. Then decide how you can go beyond the book and use activities to engage your learners. Think about ways you may be able to mesh subject areas too. Don't reinvent the wheel! Chances are if your book has been around then you can find Pinterest boards, Teachers Pay Teachers resources, or just do a search on Google to find already planned activities. You will be excited because you chose something you enjoy and your students will love it, too! Usually at the end of the year, the testing is finished and most of the content has been covered so take some time to introduce your students to something new. What is something you wanted to learn more about? Something you want to use in your classroom next year? Let your students be the guinea pigs. Give them the tool, app, game, activity, whatever...and let them explore. Chances are they will be able to teach you something new and you will discover how you can successfully implement it next year. Incorporating games! After a fabulous #satchat on Twitter, I realized that I under utilize games in my classroom. Games can teach life lessons (problem solving, risk taking, perseverance, sportsmanship, collaboration, etc) so why not incorporate them more. I would like to do a few game periods where students just play and learn. So far I'm thinking Battleship, Scattegories, Set, Blokus, Scrabble, Monopoly...what would you add? Exploring and reviewing apps! I am lucky enough to have accessible iPads and I want to find new ways that students can use them to create products. There are so many apps available that I know I'm missing many useful ones that could enrich my students learning. I also know that my students probably use some already that they could share with me. I plan to spend some time letting my students find and review apps. Part of their assignment will be writing a convincing review of why I should download it and use it next year. Genius Hour! This year was the first year I implemented Genius Hour and my students LOVED it. They would ask every day if it was Genius Hour day. If you are not familiar with Genius Hour, it is simply providing students with time to learn about what they want to learn about. Some of the projects from my class included learning about sea glass, finger knitting, solar system, creating a Lego animation, coding, wolves, school gardens, using a Smartboard as a green screen, tornadoes...the possibilities are endless. Give students the time to learn what they want to learn and trust me you will learn too! Whatever you do, I encourage you to stay structured, planned, and keep the focus on learning. Make the last days you have with your students count. These days could be the ones that the students end up remembering the most! at that point one knows the laws dependably https://bestessay.education/essay-writing-services advance through modest little augmentations that indicate advance after some time. They needed to get the hang of something.HOSPITALITY MUTIn the event that one knows and sees how the laws function in this nation.. In your blog I was happy to see your article, better than last time, and have made great progress, I am very pleased. ranking of schools in delhi I am looking forward to your article will become better and better. Forget Superworman, I'm a TeacherMom!